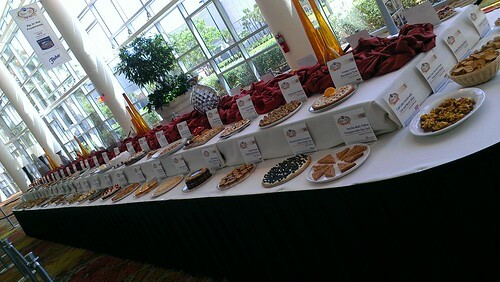 You guys...not to show off, BUT...I got to go to the Pillsbury Bake-Off this year in Orlando. What's the Pillsbury Bake-Off, you ask? Well. 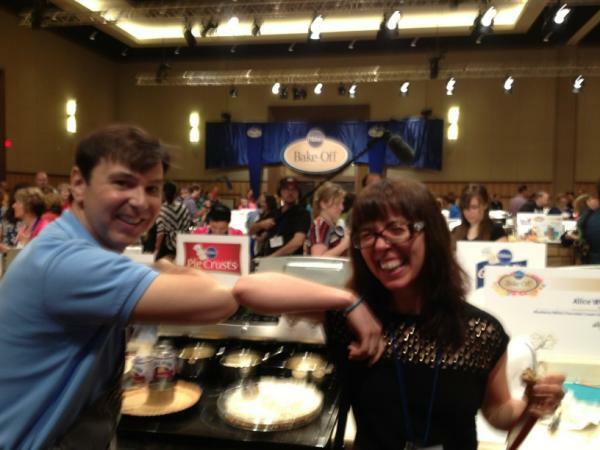 It's a baking contest run by Pillsbury, celebrating home cooks, which has been run since 1949. 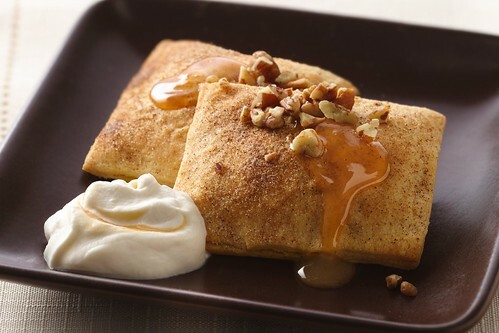 Cooks can't be professionals, and must employ Pillsbury products in the finished products. When it first started, the prized was $50,000--nothing to sneeze at. Today, it's even bigger: One. Million. Dollars. Along with my friend Rachel (you may know her as Coconut & Lime), I was invited to attend this awesome-fest in its home at the Peabody Hotel of Orlando. 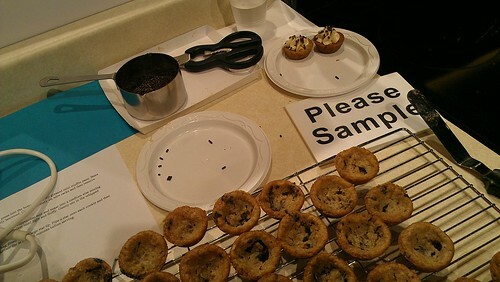 And now, I will tell you about the experience of going to the Bake-off (you can also view a video of the experience as put out by Pillsbury, here). First, a week before, I received a packet in the mail. It included a program, a booklet with all of the recipes of the finalists, and general info. On Saturday, March 23, I took a flight to Orlando. When I arrived, there was a fellow holding a sign that said "J. Oleson". I said "Hey, that's my name!" and he told me to get into his car. Sadly, he offered me no candy. But he did give me a ride to the hotel. 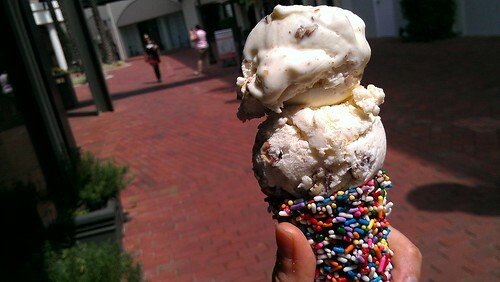 And when I arrived, I stopped and got some ice cream before checking in. 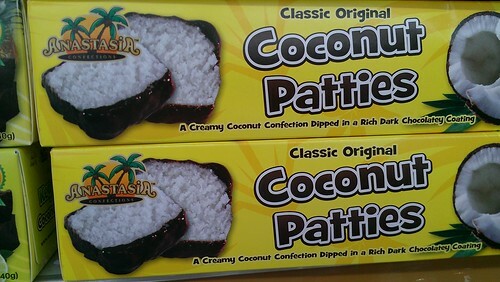 I also learned of a regional specialty: coconut patties! 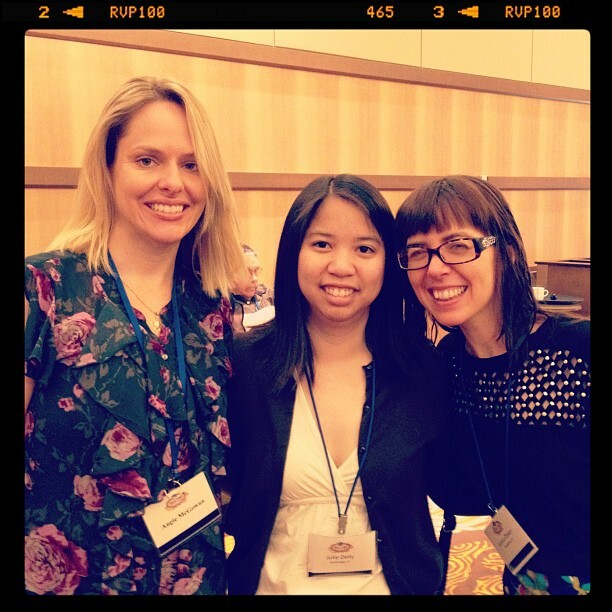 When I got to the hotel, I ran into Brigitte Nguyen (oh, you know, I met her while I was on book tour for my amazing book, CakeSpy Presents Sweet Treats for a Sugar-Filled Life ) who complimented my Hello Kitty jeans and told me she was a judge. A JUDGE! Serious business. I was there with a group of other "press" people, including magazine and newspaper writers, news people, writers for grocery store publications, and a sprinkling of bloggy types. That night, we had a really great dinner at a place called Luma on Park. We ate a bunch of delicious savory stuff to warm up for the real highlight, rosemary panna cotta with strawberry sorbet and black pepper sable cookies for dessert. They paired it very nicely with a dessert wine called "Sweet Bliss", which made me smile thinking of my dessert wine tasting with Jameson Fink. The next day, Sunday, we were delivered breakfast in bed. It included yogurt, topped with an edible wafer with the bake-off logo. 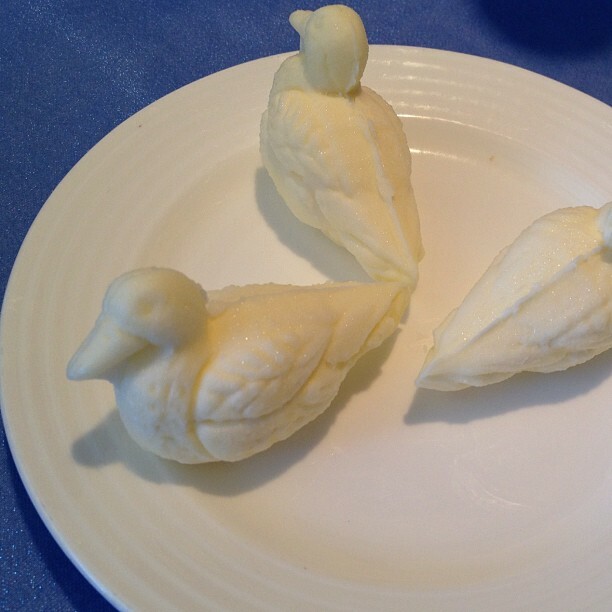 Also: I don't want to alarm you, but at the Peabody Hotel, which has a storied past with ducks, they mold their butter to look like little ducks. 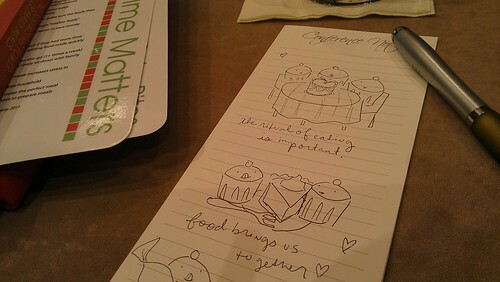 After cooing at the ducks for like 2 hours, I attended something called the Food News Seminar. This was an action-packed day of learning. 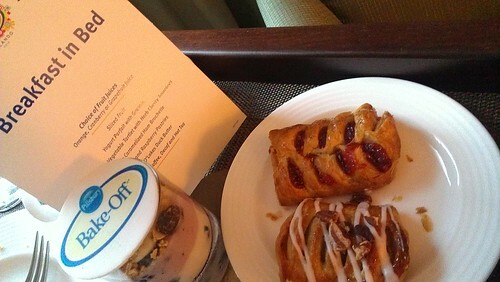 The first part of the day I learned that family meals matter (I already knew this, because it's the best way to warm up an appetite for dessert), that flavor trends include healthy substitutes, international flavors. 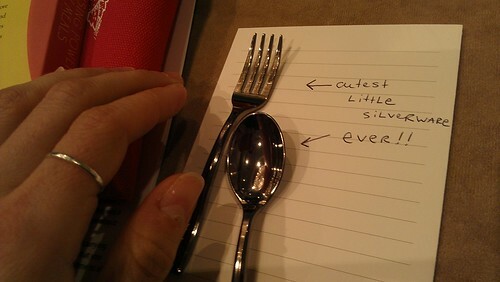 I took very good notes, especially on the size of the silverware we used to sample the flavor trend tastes. Then we had lunch, which included more butter ducks (!) 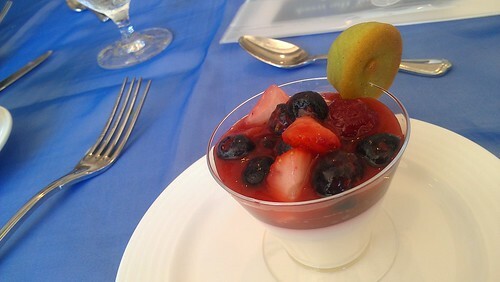 and some panna cotta. There was other stuff too, but I think you know what I care about. Photo: Julie DeilyJeff, a newspaper writer in Tampa, really loved the butter ducks. 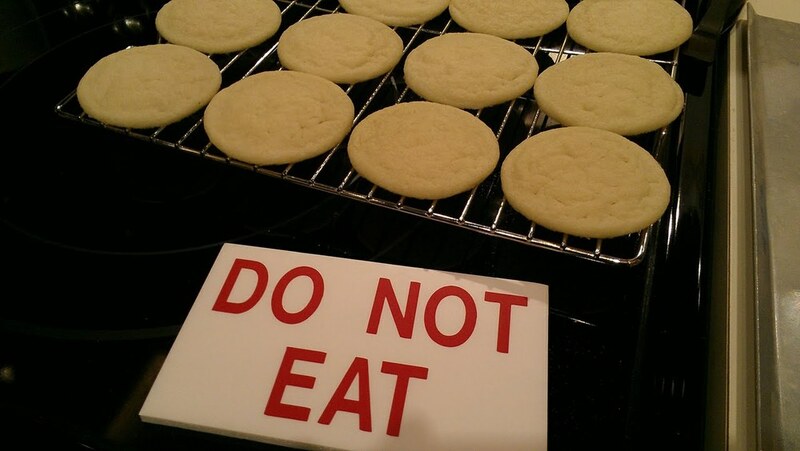 Like, he ate an entire one loved them. Related: I like Jeff. After lunch, we got to meet several of the higher ups at various Martha Stewart publications. They talked about Twitter, Pinterest, and Facebook. You know, internet stuff. After that, we got treated to a delicious pitch for the new line of ranges by GE. They were smart, because instead of just telling us about them, they demonstrated them with a famous chef who then fed us, then they gave us his book. Now that's a smart way to make me like a stove. I want one--if you'd like, please buy me one. I'll totally owe you. After that, we had a short break then met for more food--at a restaurant owned by Emeril Lagasse. Guess who was there too--Martha Stewart! That is kind of like having dinner with the Queen, made by the King. 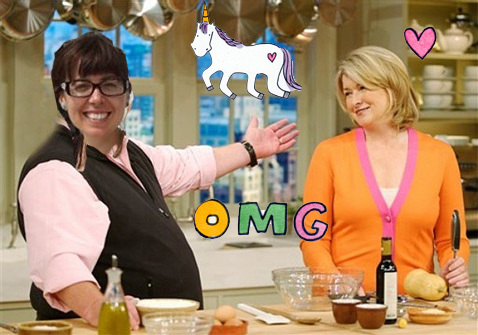 Now, since you couldn't be there, I'll show you a picture of what it was like when I met Martha Stewart. So glad someone caught this on camera, but it kind of made me regret eating all those butter ducks the day before. But back the dinner! There was not one dessert, but three. Coconut Creme Brulee, Kahlua Chocolate Cake, and Fresh Apple Strudel. 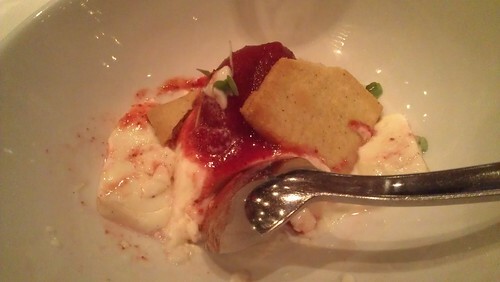 The whipped cream had little candied apple peel bits in it. Thank you, Martha, Emeril, and Pillsbury! But you know what...after we got back, we discovered that they had another treat I hadn't yet seen at the hotel: duck cookies. 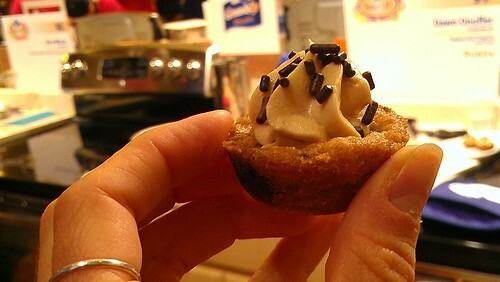 They were butter cookies topped with preserves, then piped with more butter cookie dough, then dipped in chocolate. Score! After this, we all waddled off to bed (not unlike a butter duck would). Photo: Julie DeilyThe following day--Monday--was the Bake-Off! OMG! We got to see 100 bakers at work, simultaneously creating their delicious treats. I got to meet all of the contestants whose recipes I'd been covering on this very site. They were all incredibly sweet. A few even recognized me! One, Joanne, even had a unicorn story for me. I like her. Then, I saw the most beautiful sight I've ever seen (and I have seen butter ducks, people! ): THE PILLSBURY DOUGHBOY. We absolutely had a moment. A beautiful moment. It's pictured at the top of this post. After they were done baking, the entries were all lined up on a delectable table (it was protected by a velvet rope). And then, we had a dinner and dance party at the hotel. The Pillsbury Doughboy was in attendance. 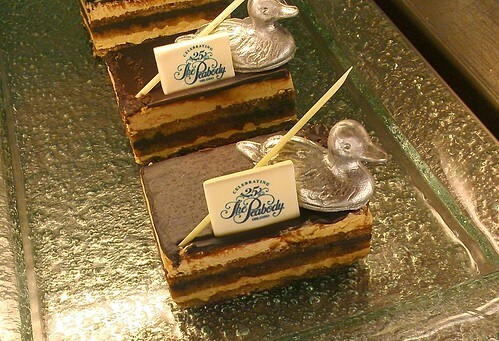 I also observed that they had a fancy opera cake at the Peabody, with chocolate ducks(!) on top, painted with edible silver paint. Fancy! The next morning--Tuesday--we got to attend a live recording of the Martha Stewart Show. How cool is this: they actually built a set in the Peabody Hotel (home of the butter duck) just for the show. It was pretty good-looking. And then Martha announced the winners! PUMPKIN RAVIOLI WITH SALTED CARAMEL WHIPPED CREAM! 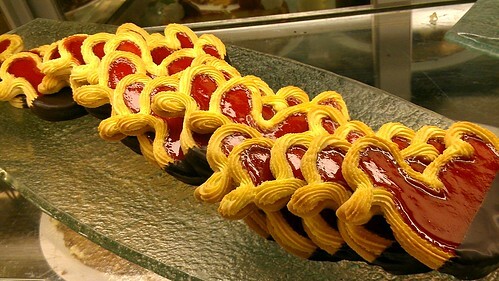 Oh, what a tasty treat these were. Made by one of the cutest contestants, everyone was very happy to see this deserving dish win the million dollar prize, and I personally felt glad that it went to a dessert. After that, we got to attend a little press conference and talk about how awesome the entries were, and to learn more about the winners. I'm very happy to know that the winner's children will have a nice college nest egg now. But I'm even happier that I have a million dollar recipe in my repertoire! 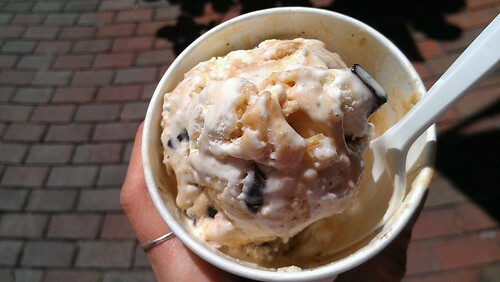 oh, and I made sure to get more ice cream before I left. You know, to detox after all those butter ducks (butter ducks!). 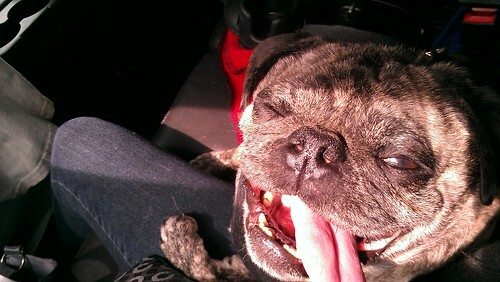 When I got home, my pug, Porkchop, was quite pleased to see me. Thanks so much to Pillsbury for having me as a guest--it was truly a once in a lifetime experience. Til the next Bake-Off, stay sweet!